Lalumiere and team after winning semi-finals against Soh. 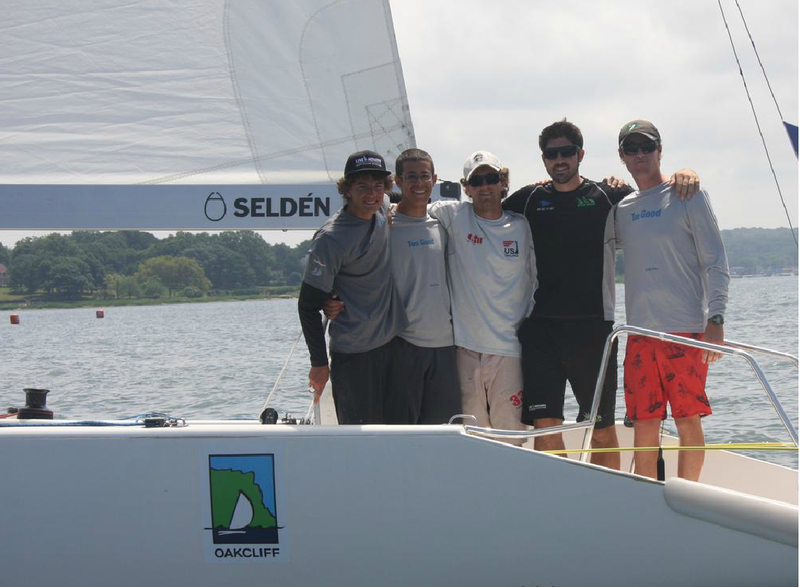 2014 Oakcliff Summer Clinegatta – Oakcliff’s Charlie Lalumiere won the Summer Invitational, a Grade three match race, on Sunday afternoon after overcoming the high level of competition. Earlier on Sunday morning, Lalumiere had been in fourth place after Saturday’s round robin. After winning two races against Maximilian Soh, who was in previously in first place, in the semi-finals, the team was confident about securing their spot in the finals. Lalumiere’s team went on to beat out Peter Holz’s team three – zero in the finals. ‘Overall, the competition this weekend was tough. During the finals, Holz definitely put up a good fight,’ said Christopher Poole, one of Charlie’s team members. ‘We only beat him by a half a boat length each race, so it was crucial for me to make the right tactical calls.’ Poole, who is an accomplished match racer himself, is ranked 28th in the world. Lalumiere’s crew also consisted of Colin Kennedy, Kilian Duclay, and Austin Colpaert; each of them are current members of Oakcliff’s training programs. Lalumiere and Kennedy are a part of the Sapling program, and Duclay and Colpaert are a part of the Acorn program. ‘Over the past few months, Oakcliff has provided me with the support needed to be successful. I am truly grateful for the opportunities that Oakcliff has presented me with, and I could not have received this support anywhere else,’ said Lalumiere.